How fantastic has this weather been? Warm days, balmy nights! No wonder that the peak wedding season is upon us. Have you been looking at places around Perth for your wedding reception? There are so many wonderful choices here in Perth! Your wedding reception could be held at numerous places along the Swan River from The Boatshed in South Perth to Maylands Yacht Club, Bells Function Centre, Matilda Bay and many more. You could even head out to the Swan Valley to places like Sandalford Winery or retreat to the South West to Busselton or Dunsborough. The choices are endless and the final decision could be a hard choice as they all have good points. There is one option that does get over looked and I get excited when a booking comes though with this type of venue as it spells PARTY! Let’s explore this option further for your wedding reception. There can be many cost reducing benefits to a home wedding. No venue charge is one that immediately springs to mind! 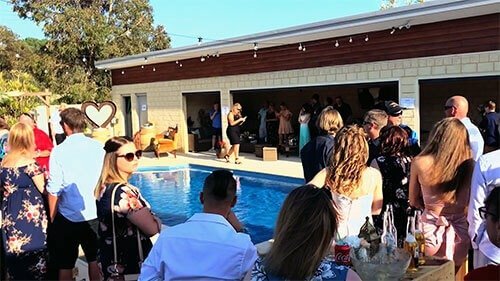 Catering could be a simple barbeque or catering by a spit roast company and further savings can be had on providing beverages – and if they aren’t consumed on the night you get to keep them!!! There are other benefits, as well, such as – any children can be included easily, less formal house rules, no restraint on finish times and if the guest have a few too many, they can always sleep on the couch! Last Friday night, I was fortunate enough to secure a booking to DJ at a wedding reception at the Bride and Groom’s home. Courtney Murphy was part of the celebrations and his voice was well received. We overlooked the pool area where the marriage ceremony was performed and the vibe from the guests was a very relaxed and loving; with the formalities kept to a very bare minimum! The vows took around ten minutes and there were no speeches or big formal entry…The only formal part of the night was the bridal dance! I tend to keep the music a little more up-tempo when performing at home functions as guests tend to be moving around more and sitting down less. Here’s what the Bride and Groom emailed me after their wedding. Just wanted to say a big thank you for Friday night – it was fantastic & the music was perfect. Everyone had a brilliant time & loads of fun. Please pass on my thanks as well to Courtney, who was simply perfect. Amazing, amazing, amazing! Could not have had a better music selection for our special day. So if you’re thinking about alternative venues, give some thought to have your wedding and reception in your backyard. And if you want some advice or guidance, I’m more than willing to help you create the perfect night for your wedding reception.